The relative health of the US corporate sector can be gauged by the metrics around leveraged companies, which tend to be vulnerable to fluctuations in economic conditions. 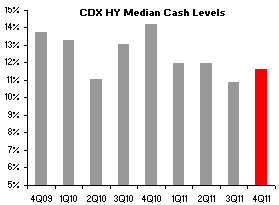 Companies comprising the CDX High Yield Index make up a good sample for this analysis. These include firms such as TXU, Harrah's, Realogy, Royal Carribean, etc. The first metric that analysts tend to review is gross leverage (debt to earnings), which has risen somewhat in Q4 of 2011. Another important indicator is the level of corporate cash positions. And those have increased as well during last quarter. 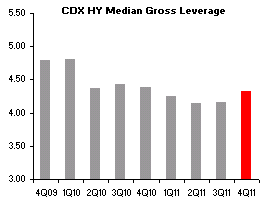 Subtracting cash holdings from the debt amounts, one obtains the "net leverage". 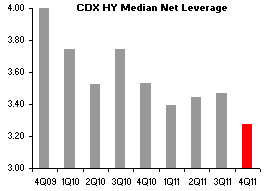 In spite of higher debt levels, the large cash positions have brought the net leverage to the lowest level in years. Why would firms borrow more money (increasing gross leverage) when they have such large cash positions? The answer has to do with what these firms were experiencing in Q4 of 2011. The global economy, impacted by the events in Europe, looked like it may enter a double-dip recession, So firms who had the opportunity to raise new debt did so, but kept a large portion of the proceeds in cash in preparation for rough times ahead. Companies also had direct reasons to become defensive, as they saw their free cash flow stay at depressed levels. The causes of lower free cash flow included increases in working capital, greater CapEx, lower gross margins, and higher inventory. 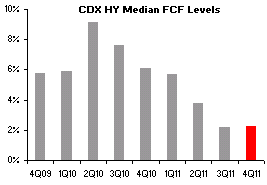 Q4 was not easy for the HY CDX firms. In spite of these headwinds, earnings have been coming in relatively strong with Q4 "beats" at roughly three times the "misses" (although a number of companies are yet to report). Going forward it will be critical to see how these firms perform and the metrics around their leverage, cash positions, and free cash flow, as these will tell us what risks the US corporate sector may be facing.